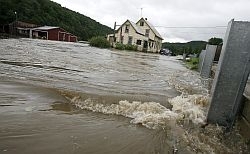 (Host) Another series of heavy rainstorms caused widespread damage across Vermont over the past 24 hours. Meteorologists say weather patterns over the Atlantic Ocean and along the jet stream have trapped the region in a vise grip of storms. And, as VPR’s Ross Sneyd reports, the bad weather could continue for a while, yet. (Sneyd) Roads have washed out. Buildings flooded. Homes and camps have been evacuated. This summer has not been one for those with a weak constitution. Especially in Addison County. Dan Werner is operations director for the town of Middlebury. (Sneyd) Consider that in Ripton, a small mountain town just east of Middlebury, crews had just finished repairing some of the roads that washed out in June. Much of that work has now washed down the hillside again. Bruce Berryman, chairman of Lyndon State College’s meteorology department, says there’s a term for this. (Sneyd) Berryman has studied Vermont weather records. Over the past century, average temperatures have risen about one degree. And precipitation has risen over the past 25 years. (Sneyd) Jay Shafer also teaches meteorology at Lyndon State. He has a different term for why this weather has been so unrelenting. (Sneyd) That area of high pressure over the ocean is caused by warm water temperatures at the surface of the Atlantic. A more southerly flow of the jet stream has kept the storms funneling into our region, where they stall when they hit the high pressure over the ocean. Shafer says it could take time for those ocean water temperatures to fall. That means the rainy weather could extend into the fall.